Moki Moki is a mind-bending, gravity-defying puzzler! The Moki are being devoured by the voracious Gromblins, and it's up to you to guide the hapless little guys to safety. 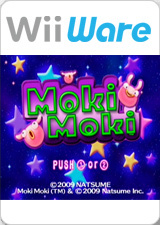 Bend, twist, and rotate the environment to herd the Moki through a series of brain-teasing puzzles! Along the way, you'll have to contend with deadly pitfalls, spinning blades, and shifting gravity. Roll Moki down ramps, grab them with hooks, and blast them with jets to guide them safely to the portals. Challenge your skills over 100 totally unique levels! The graph below charts the compatibility with Moki Moki since Dolphin's 2.0 release, listing revisions only where a compatibility change occurred. This page was last edited on 21 January 2018, at 13:36.